Have you ever had one of those crazy ideas? That once you get it, you can’t let it go, and you will do whatever you can to fulfill it? Well I had one of those moments. And it involved a 400 pound tub. Maybe it was because it was spring, or because the night before I had a horrible migraine, but either way I got the idea. That same day my mother and I were in the car in search of a claw-foot tub. Thankfully I knew just the store where you could get a claw-foot tub. Downtown Lynchburg, there is a store, a magical store called Bailey Spencer. The first floor is like almost every store, though the people there are wonderful and so very kind. But the second and third floor! They are truly the most wonderful part about the entire store. The first thing you see when you walk up the stairs are wooden double doors that are so very gorgeous. Those doors are so amazing that they just must have so many stories (that I will hopefully tell one day). The 2nd floor is simply packed to the brim with door upon beautiful door. The 3rd floor is just as magical. Though not with doors, but it had metal fences, stained glass, sinks, and a row of claw-foot tubs! Knowing that I could find one there I was amazed to find such a wide selection to choose from. Making my selection and after talking with the owner everything was arranged for the tub to be delivered five days from that day. The people there were so helpful and I am grateful to have worked with them. The hardest part was keeping it a secret from my father and sister what had no idea of the monstrous thing that would be arriving in our back yard. Come Wednesday the amazing men (Bailey Spencer and Anything Doors) delivered the tub and set it exactly where I wanted it (Thank you guys! Could never have done it without you, can’t wait to work with you again! 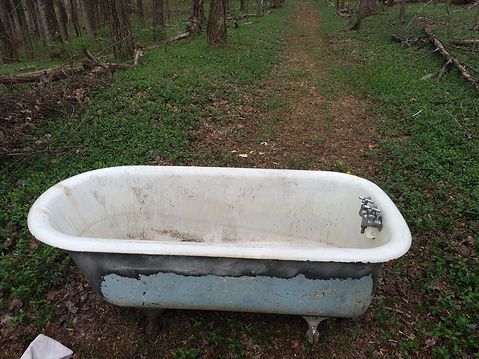 ), leaving me with a giant tub in the middle of a path leading into the forest. My mother, who I must say first mentioned the idea of the tub, and I were so excited, though my sisters first reaction did damper my spirits quite notably. But I had, and still do, a 400-pound tub! It’s crazy, if you think about it, what photographers will do to get a good shot. The next day I absolutely couldn’t wait to shoot in the tub. First though I had to clean it, since it was covered in dirt and had a water ring. After I got it clean I stopped up the drain I went to grab a hose. 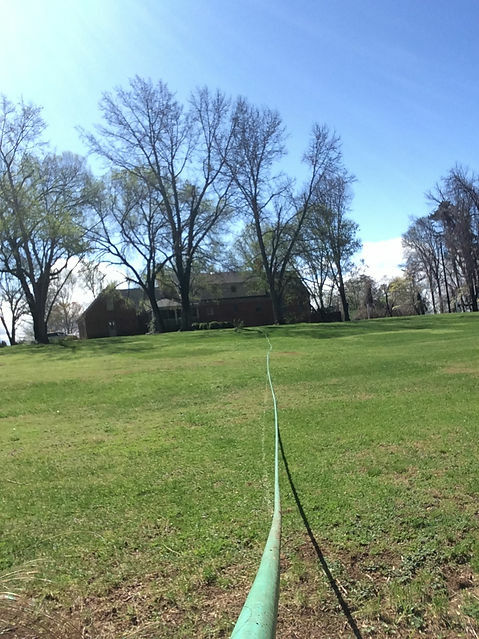 3 hoses later and it still would not reach the tub. So finding another, I was able to get water pumping into the tub. I ran inside so excited to finally be doing the photoshoot I had been planning for days and waiting patiently for. Finally the day had come. Gathering the things I would need, I proceeded outside and set up my camera… after, I must say, I moved a whole bunch of brush and logs to clear the background. I took a deep breath and stepped into the water, then nearly jumped back out again. The water was so frigid that I thought I would instantly freeze. It quite possibly could have been the coldest water I’ve been in…well, that might not be true, but it was close. Stealing my nervous and spending some time hovering above the water, I finally started to dip myself into the water. I am so glad that I did, because there is nothing like sitting in cold water out in the middle of the forest. These moments, whether it be sitting in a tub or running through wet grass at sunset or laying on a grave out in public, no matter how crazy they are I am the most alive while doing them. The idea that I am creating art and being myself is one of the most amazing things. I wouldn’t trade it for the world. I could feel the blood in my veins rush with excitement and my heart pound. The few minutes I have of the perfect light puts pressure on me to stretch to perfection. Twirling alone in a field to my own music or perching in a nest places me into other stories transports me right into another person. Characters with their own stories and feelings. I feel myself walking in someone’s shoes experiencing their world for just a few minutes. Worlds merge, characters shift and change and interact with each other, magic is made, my mind clears and my heart soars. Making images is something so amazing and exciting for me. Telling stories that other wise would be pinned up in my brain, caught in a cage (ohhh photo idea! ), photography is a way to set those ideas loose. After realizing that sitting in freezing cold water for longer than needed probably was not good, and seeing goose bumps through my nightgown, I forced myself to get out of the tub, no matter how much I really wanted to stay. 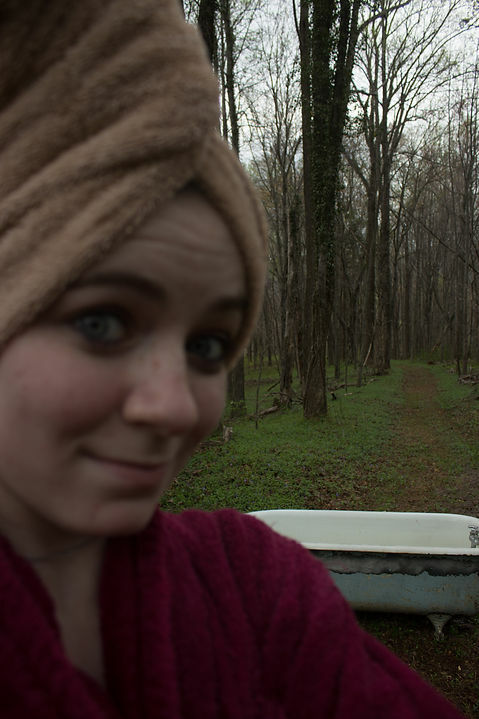 There is something about sitting in a tub by yourself in the woods that makes you lose yourself and find yourself all at the same time. And it is truly inspirational when that happens. When I finally finished editing the image I can say that I absolutely loved it. The story of a girl and her butterflies, dreams that fly on wings. Fleeting and beautiful.